With automatic, variable rotation, depending on system temperature. This ensures a lower demand for hydraulic activation of the fan motor, therefore lower fuel consumption, particularly in periods of low temperature (night and winter). Case IH FPT engines, designed by FPT Industrial and Case IH, deliver power and responsiveness for the most demanding agricultural applications. Customers who tested Smart Cruise reported fuel consumption savings of up to 26% compared to machines without Smart Cruise. In fields around the world, the performance of Case IH FPT diesel engines speaks for itself. The proof is in literally billions of hours of Efficient Power operation from a proven global leader that consistently sets industry standards. Raises and lowers the lever depending on the amount of counter pressure that the soil exerts on the crop dividers. Automatically controls the height of the cutting disc and provides better quality cane cutting, thus avoiding stump losses. Located on the sides of the cab roof, for monitoring the elevator, and under the slew table, for monitoring the work done by the basecutter, before releasing the cane. Created by Case IH, the exclusive Antivortex system reduces vegetable impurities and cane loss and increases load density. Chain-tensioning system with end springs to prevent premature chain wear or breakage. Antivortex system allows for better airflow, which improves cleaning, with low incidence of billet loss and reduced power consumption. With only 1 nut and measuring ruler, faster to adjust and greater precision. For further cleaning with 360° slew, for better cane distribution and to prevent it from being deposited on the transporter. With hydraulic activation for better billet distribution in the transporter and better adjustment and use of the crate volume. Measuring 900 mm, for better reach and good positioning of the transporter on the line, so that the billets are better placed in the transporter. For longer life and easy replacement during maintenance. Large capacity with reinforced edges for longer life. All large sections of the elevator are made of strong materials, for increased durability and less downtime. Prevents the elevator from impact damage and the flight from contacting the transporter. Hydraulic damping for more smoothness at the end of run and lower elevator impact. For removing sugarcane and soil build up from slew table. Increases the lifespan of the wear components and improves adaptation to the conditions of the sugarcane fields. For more ruggedness with less possibility of the elevator structure twisting. Large cleaning area reduces occurrence of mineral impurities in the harvested stems. Easier service. Saving time, improving safety. For maintenance requiring a raised suspension. With 10 metres of cable, to assist during night maintenance. Provide safe access to the upper part of the harvester. With capacity for 4 blades on each side and a complete exchange of the 2 rollers. Located in sliding drawers for ease of assembling and dismantling when necessary. To connect 12 v devices or a light. To remove accumulated cane from difficult to access areas. With external access to the bearings (bolts on the external side of the chassis) and rubber stops, there is a 83% reduction in the time required for exchanging all bearings, i.e., from 15 to 2.5 hours. Located on the engine box door to enable easier maintenance. For safer changing at ground level. To facilitate and increase safety in accessing the engine compartment. 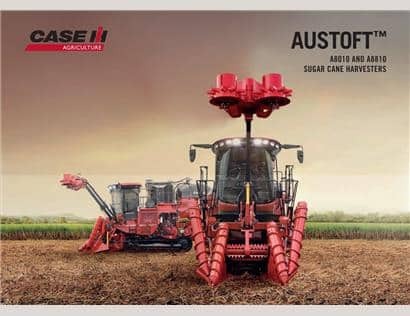 When the days are long and the nights are even longer, you will come to really appreciate the industry-leading comfort and intuitive operation of the Austoft cab. 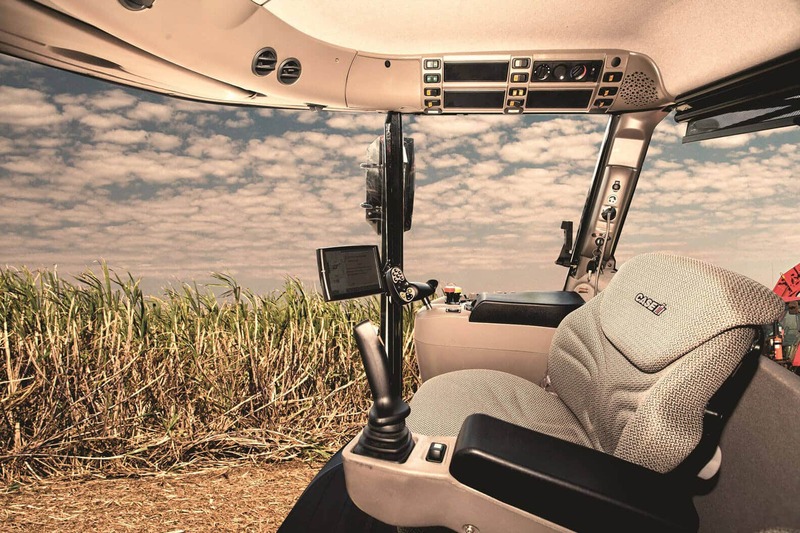 Guided by input from producers and custom operators, Case IH has taken one of the cane producers largest and quietest cabs in the industry and made it even better. The redesigned Case IH cab provides the ultimate in convenience, comfort and productivity for your office in the field. The enhanced Case IH right hand console moves with the seat to control most vital functions, with the operator’s arm in a comfortable resting position. Similar functions are grouped together and multiple settings for conditions are easily saved for future use. You can keep your eyes on the field rather than searching for knobs or buttons. In addition, all models use the state-of-the-art AFS® Pro 700 display for machine functions and guidance control. Easy to use, AFS® Pro 700+ comes with features to increase productivity through ease of operation and less operator fatigue. Genuine Case IH parts are available from Case IH dealers worldwide. Find your local Case IH dealer. If you need additional information from us or would like to learn more about our products and services, please contact us.